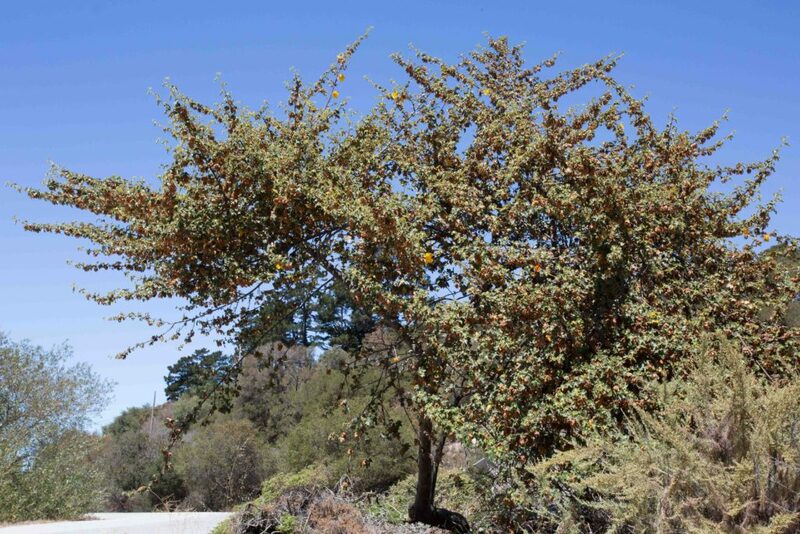 This large shrub or small tree is often seen planted in freeway medians. 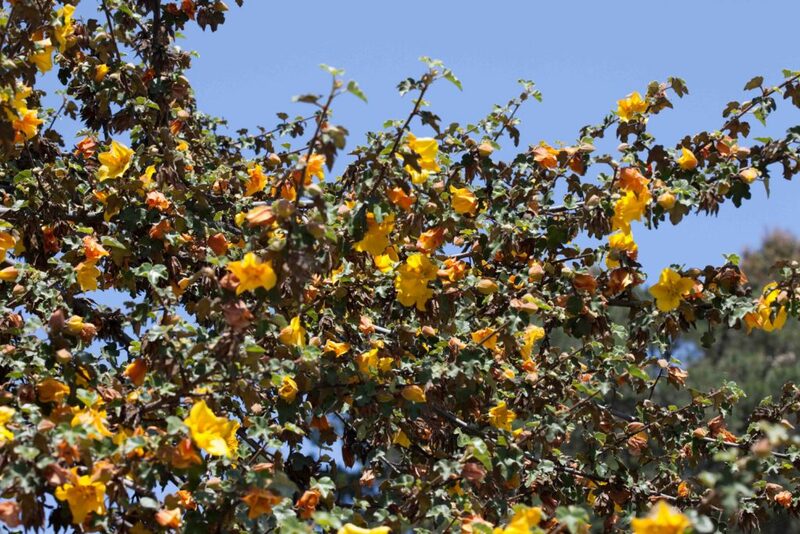 It has a profusion of large, bright yellow to yellow-orange, soft-hairy flowers, open, 5–6 cm across. 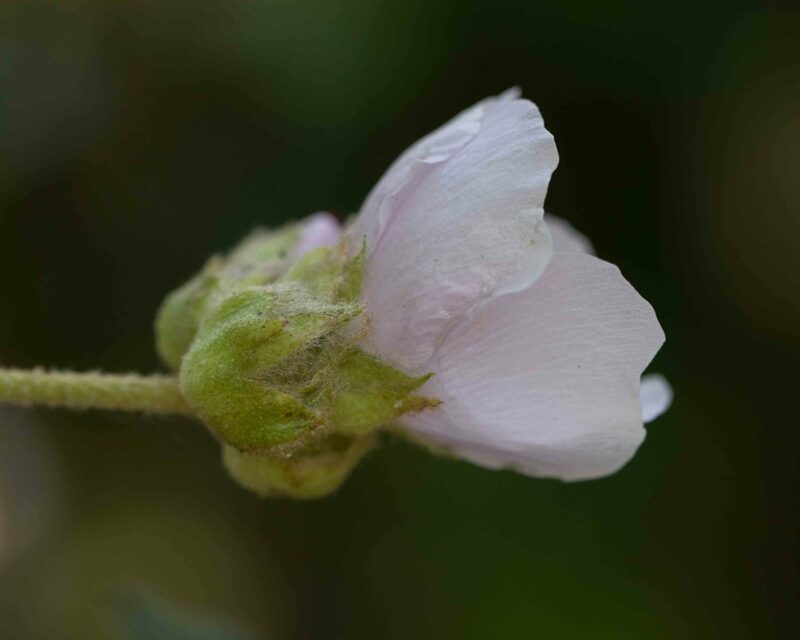 It has no petals but 5 large, silky, petal-like sepals. 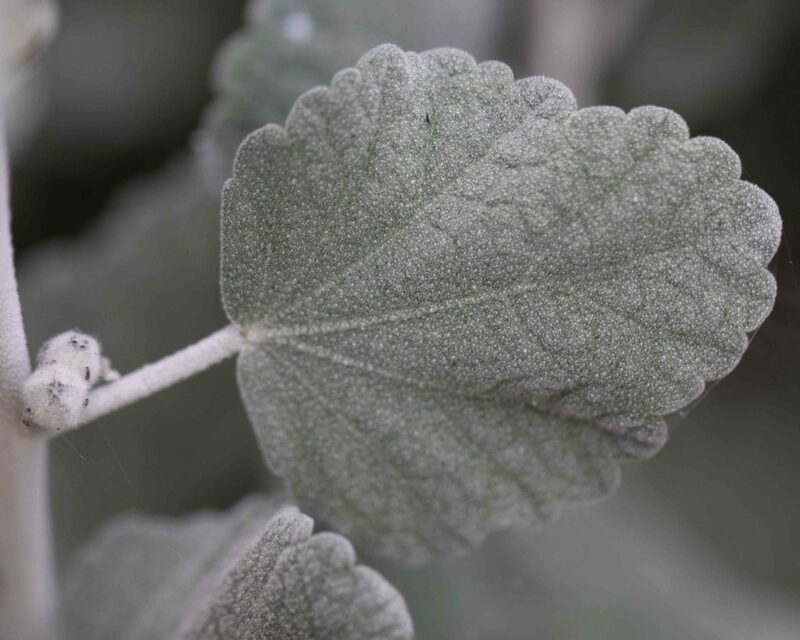 Leaves are leathery and covered with coarse stellate hairs that can make handling them without gloves a painful proposition. 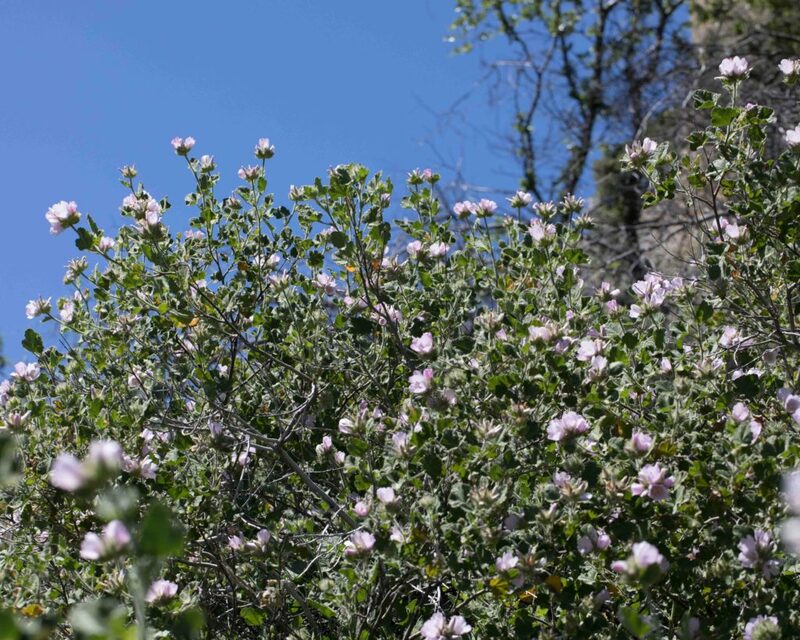 Found only in Monterey County and occasionally in San Luis Obispo County, this is known largely from Carmel Valley and Fort Hunter Liggett and surrounding areas. 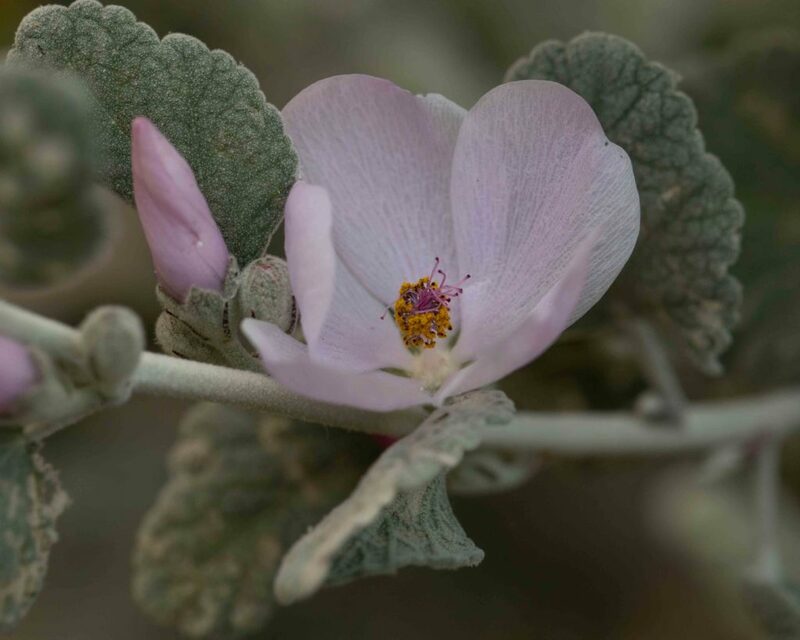 It has typical bush mallow flowers, pale pink and bowl-shaped, generally in a head-like cluster. 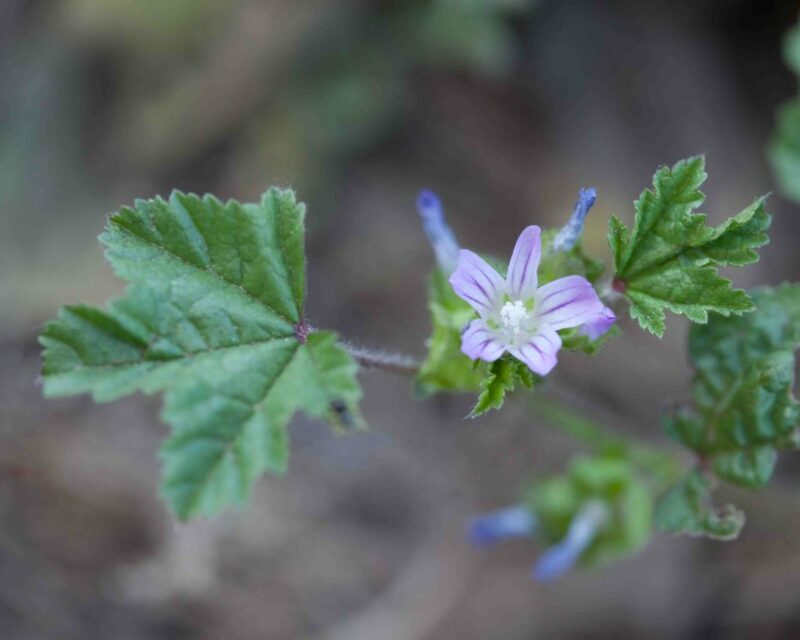 It has leaf-like bracts, often wider than the petals. 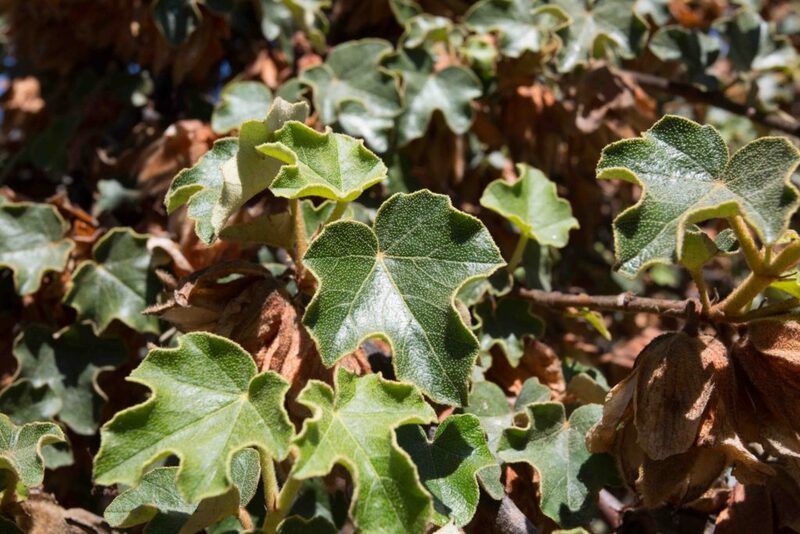 Leaves are bright green, becoming glabrate above and stellate-hairy below. 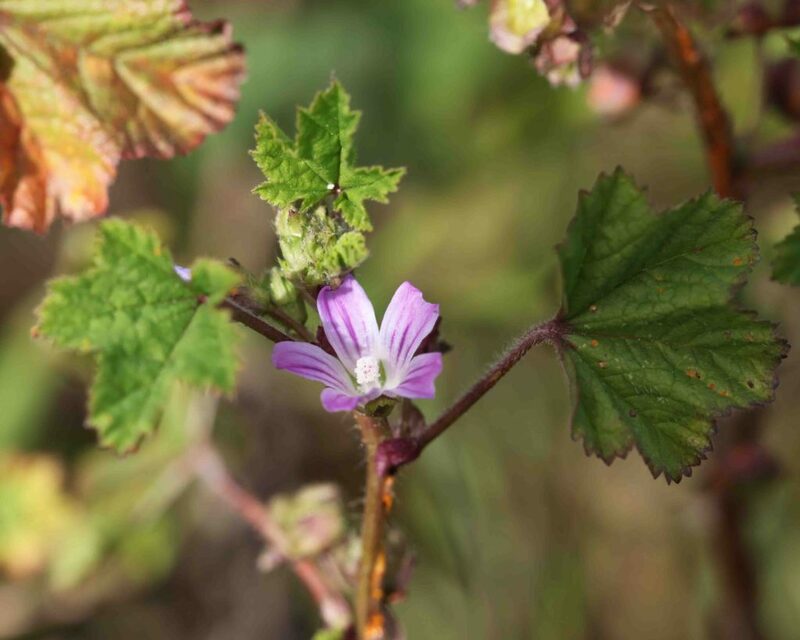 Found only in Monterey County and San Luis Obispo County, this is most commonly seen in the southeastern part of the County around Parkfield and Vineyard Canyon Road. 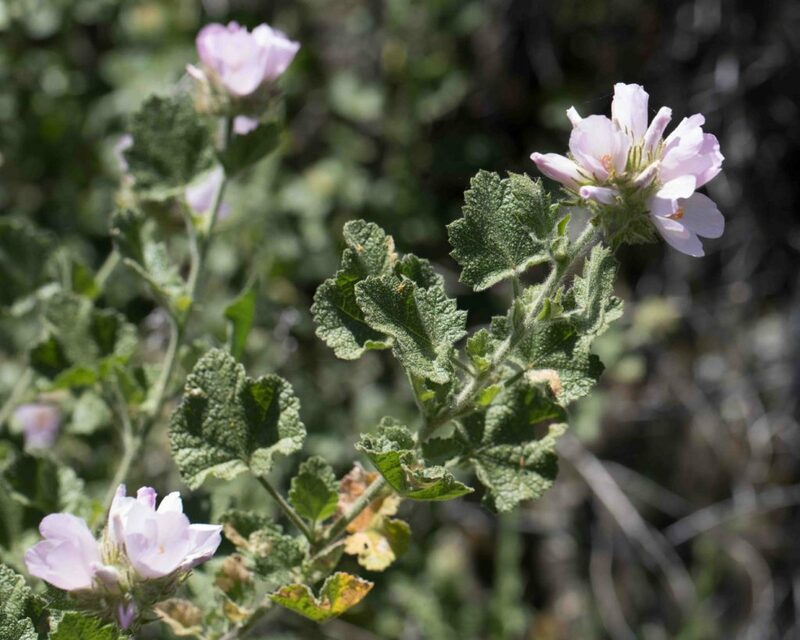 It is most easily recognized by its very pale gray-green leaves and stems, velvety to white-tomentose and stellate-hairy on both surfaces. 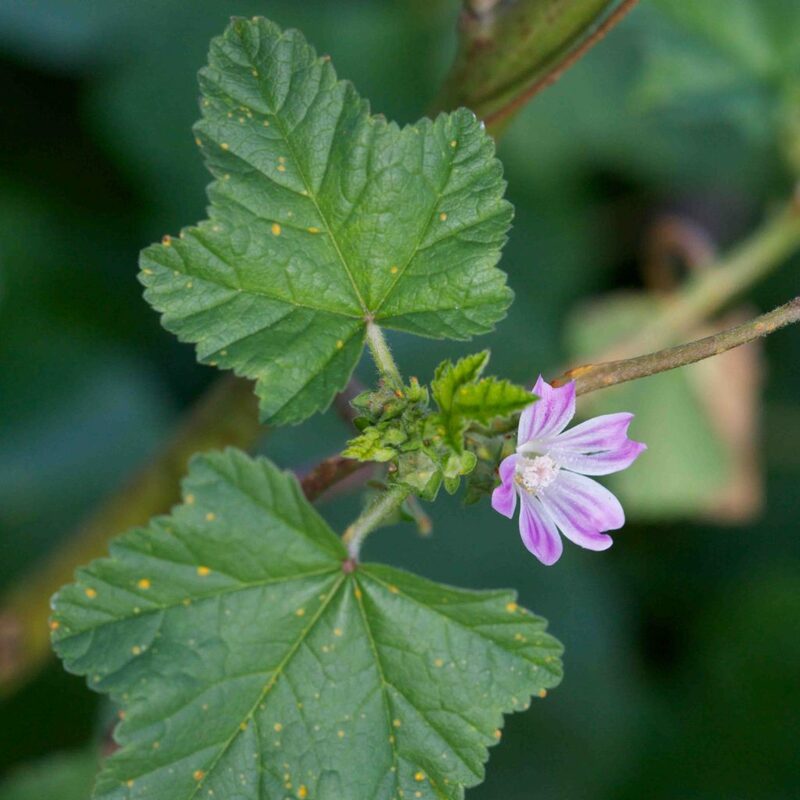 The calyx lobes are strikingly different from some other Bush Mallows, awl-shaped to lanceolate, noticeably longer than they are wide. 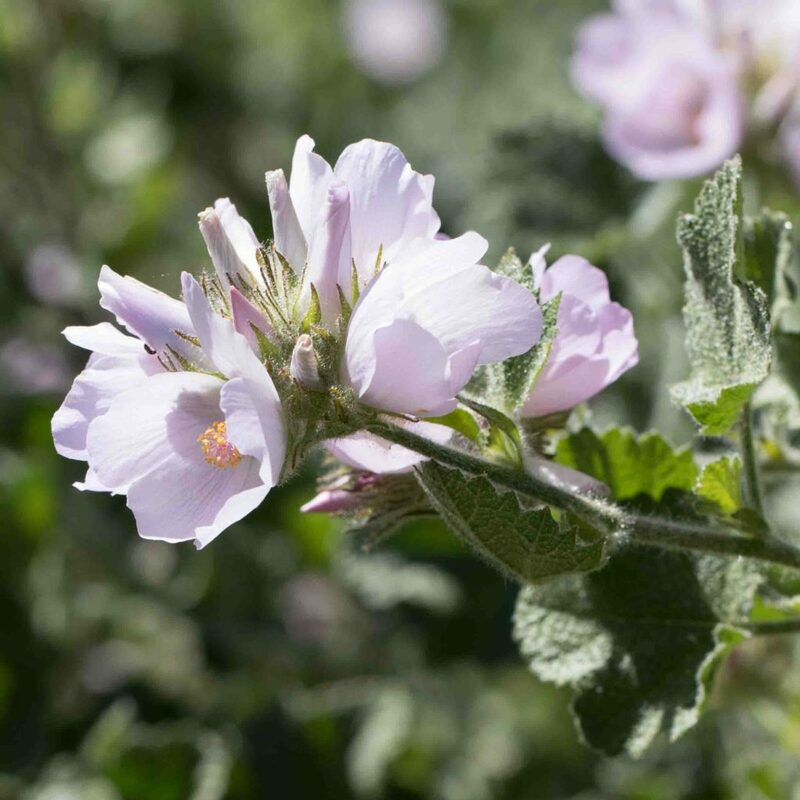 Flowers are similar to other Bush Mallows, pale pink and bowl-shaped. 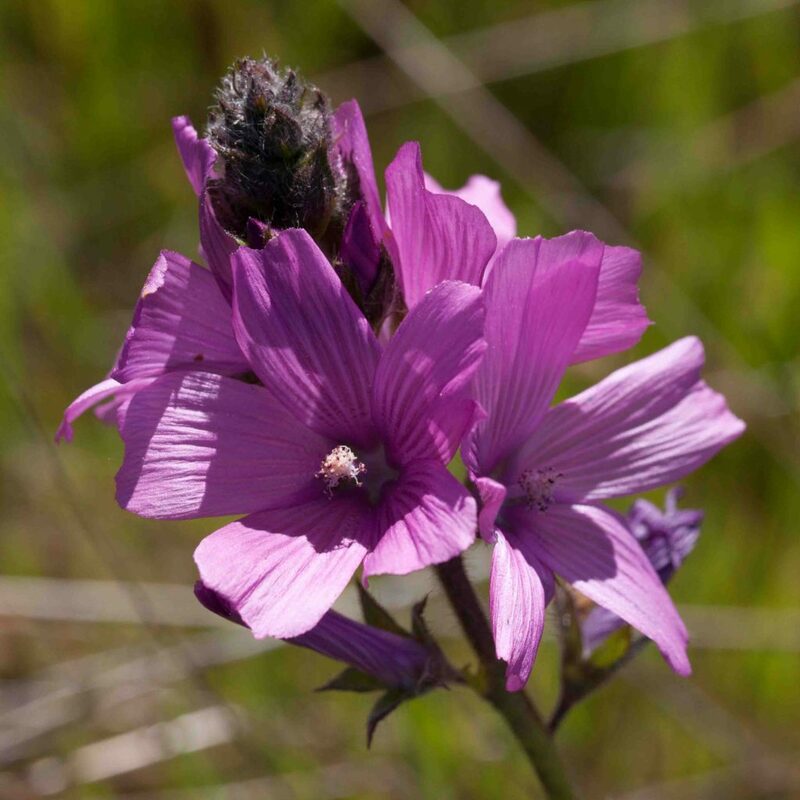 This is one of three common non-native mallows. 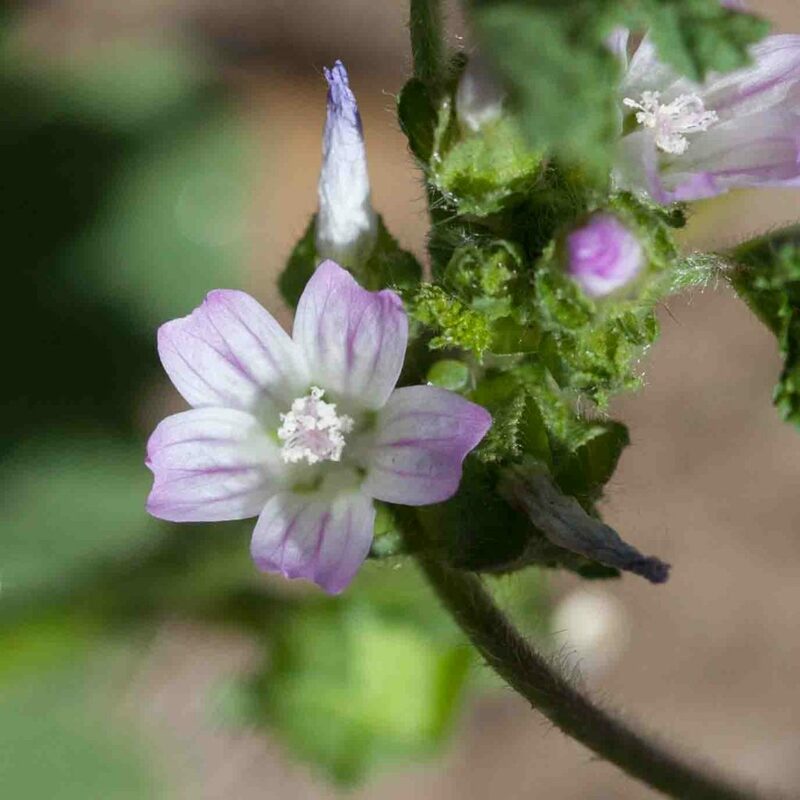 Like Cheeseweed (Malva parviflora) it is a small to medium sized shrub with 5-petaled flowers, pink to blue-violet with darker pink veins and coarse, roundish to kidney-shaped leaves. 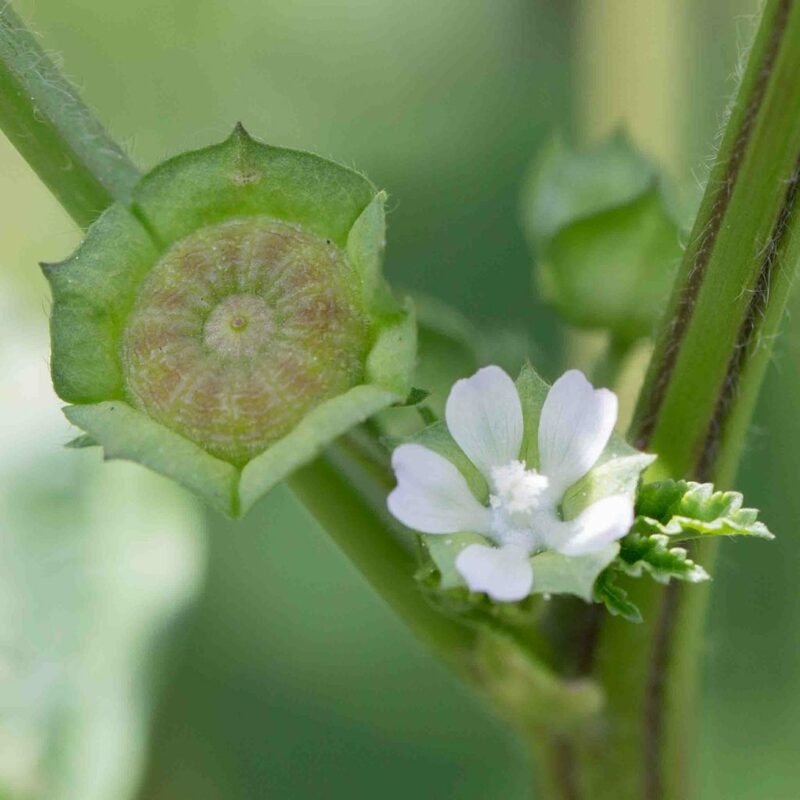 This has petals about 2× as long as the calyx which itself is 4–6 mm long, larger when in fruit and sometimes enclosing the fruit. Fruits are flattish with 7–10 segments. Bractlets are 4–5 mm, ovate to oblong. 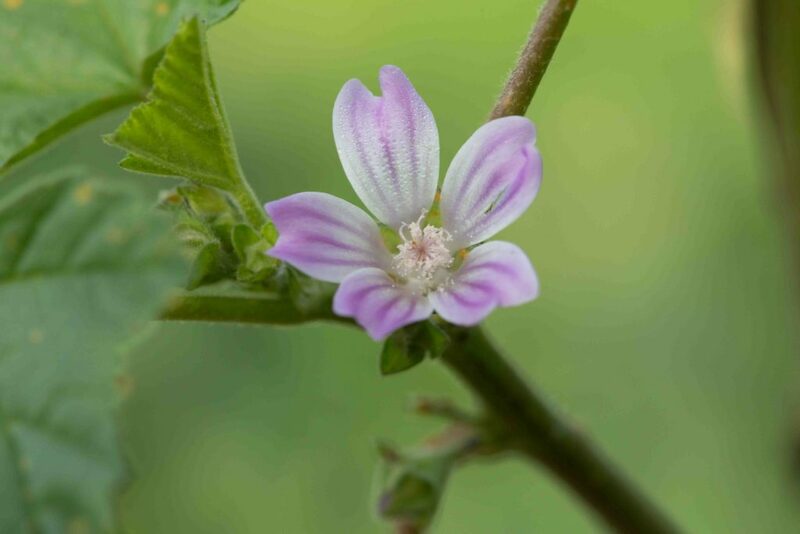 This is one of three common non-native mallows. 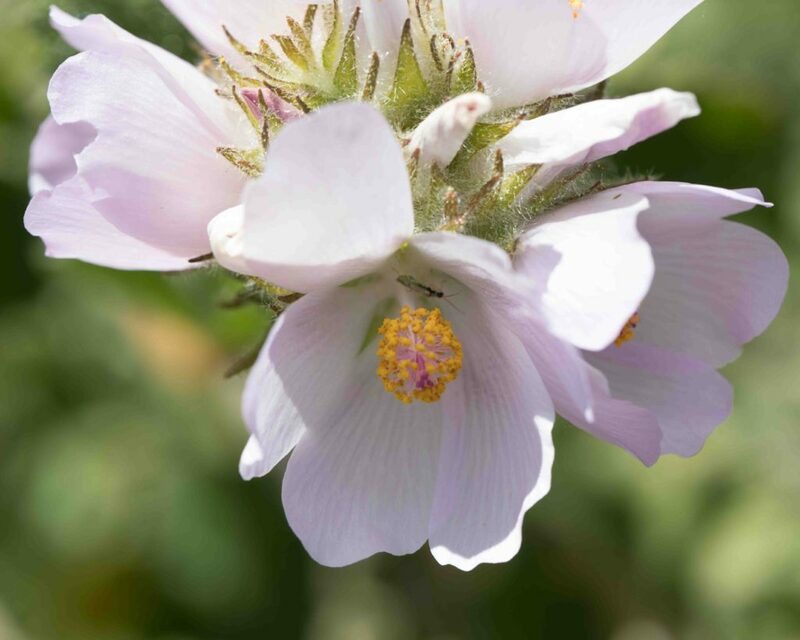 Like Bull Mallow (Malva nicaeensis) it is a small to medium sized shrub with 5-petaled flowers, white to pinkish with darker pink veins and coarse, roundish to kidney-shaped leaves which are often more or less folded. 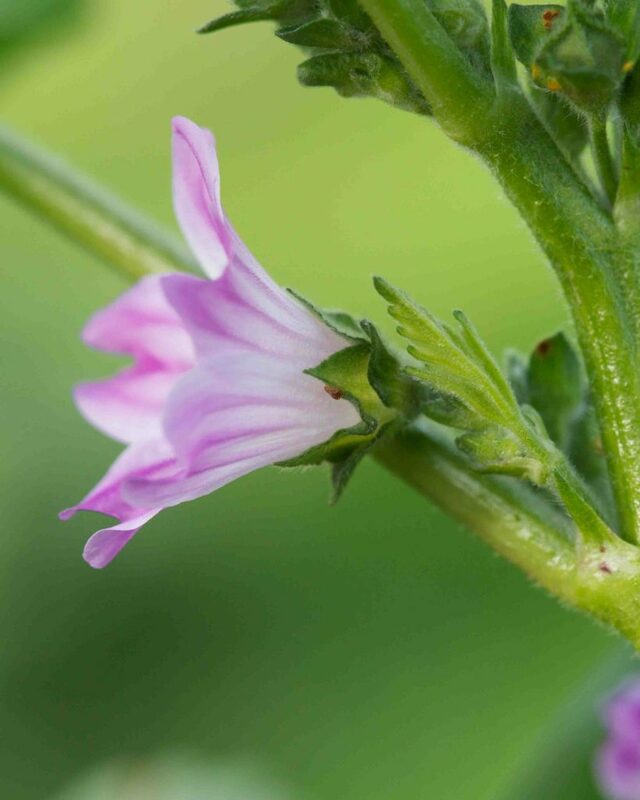 This has petals equal in length to the calyx which itself is about 3 mm long. Fruits are flattish with 10–11 segments. Bractlets are 1–2 mm, linear to thread-like. 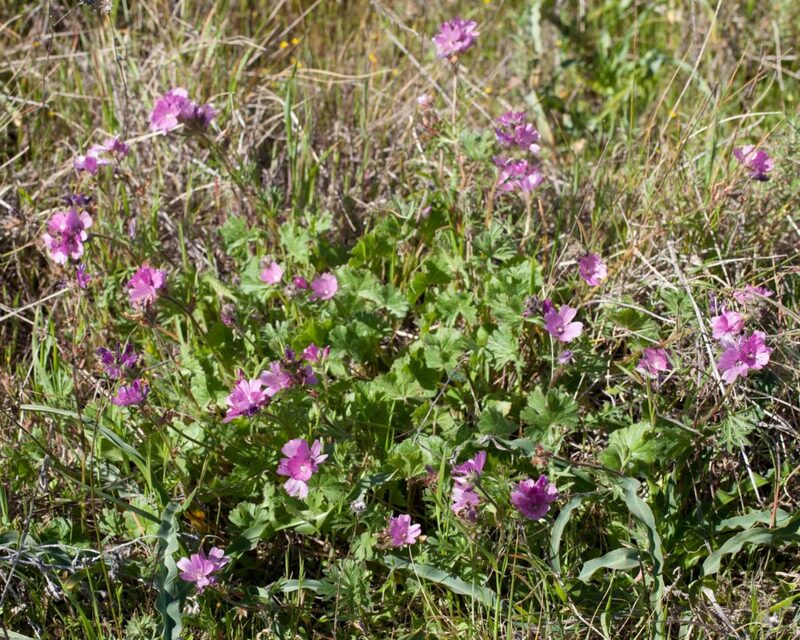 This is one of three common non-native mallows. 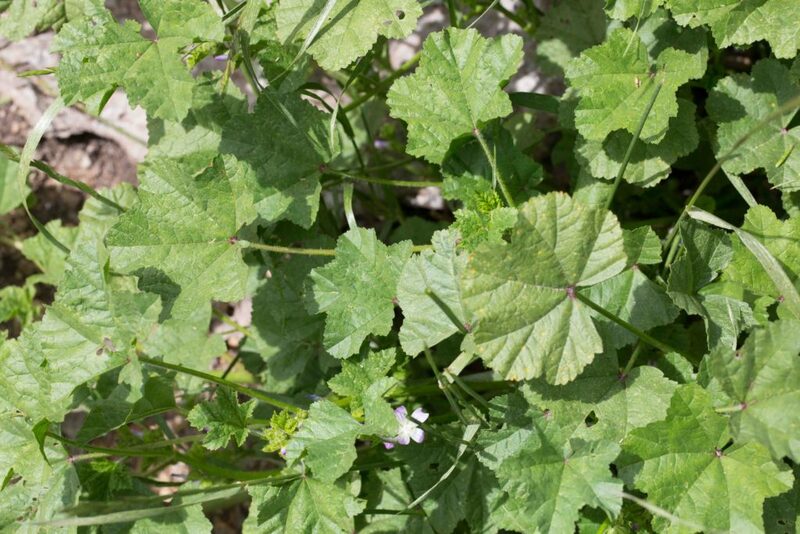 Unlike Bull Mallow and Cheeseweed (Malva nicaeensis & parviflora) it is a large shrub with correspondingly large leaves, coarse, shallowly 5-lobed, up to 10 cm long. 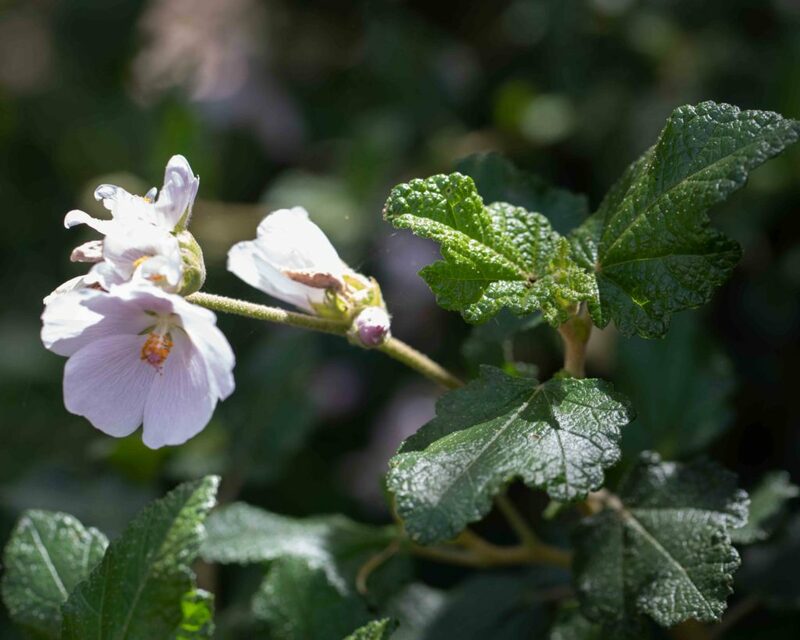 The flowers are similar, 5-petaled, white to pinkish with darker pink veins and coarse, roundish to kidney-shaped leaves which are often more or less folded. 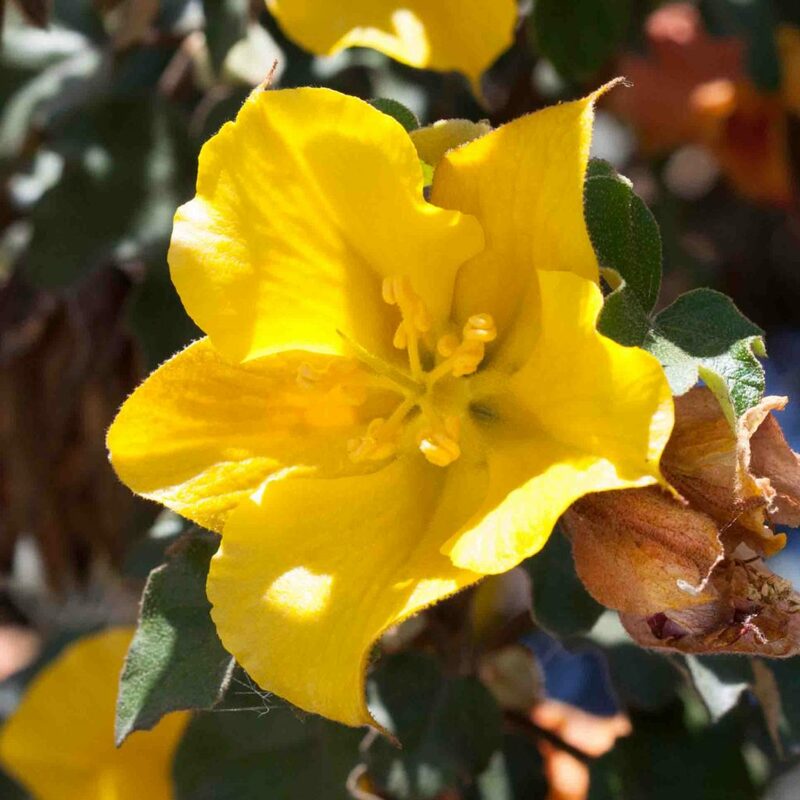 This has petals more than 2× as long as the calyx. 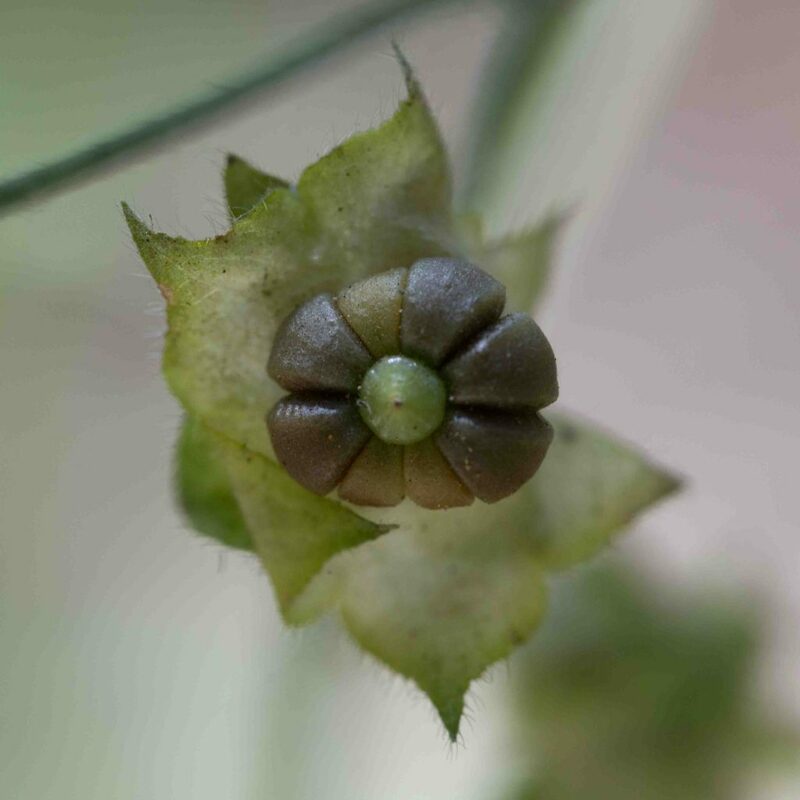 Calyx lobes are triangular with acute tips. Fruits are flattish with 5–6 segments. 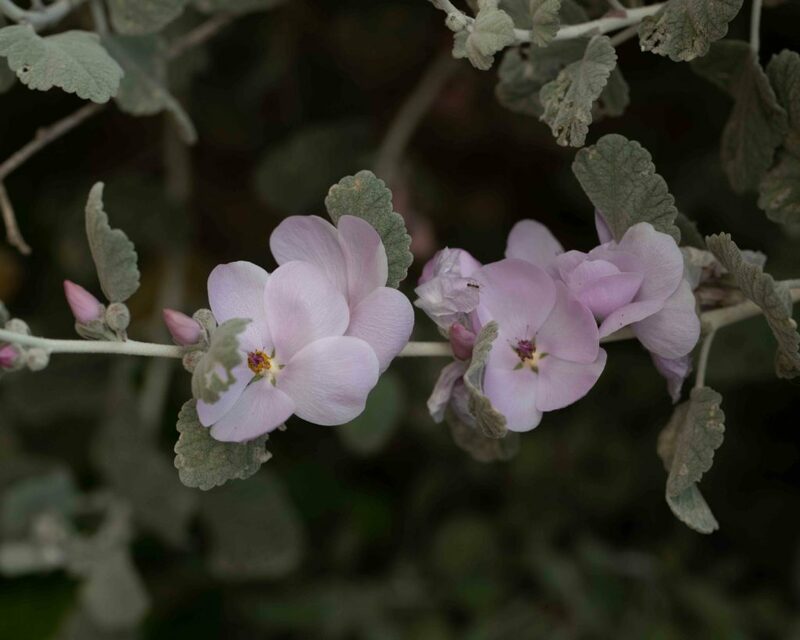 Bractlets are ovate to round and shorter than the calyx. 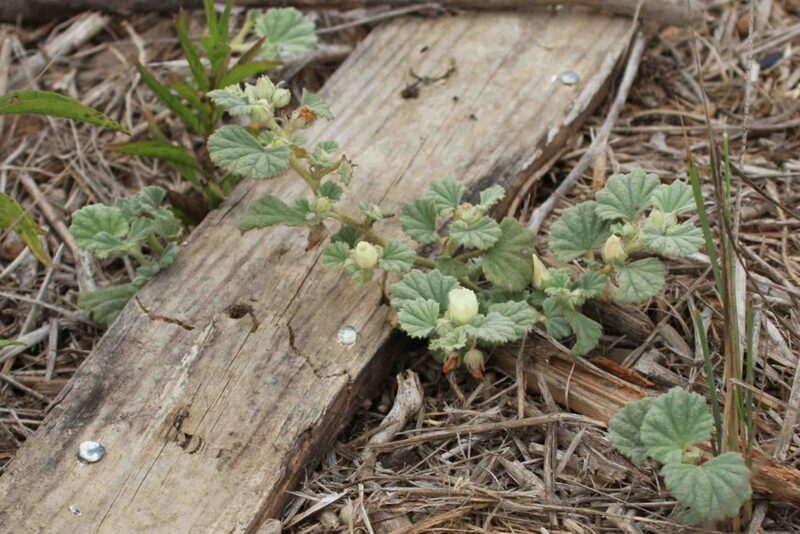 This is a prostrate plant with a hairy stem. 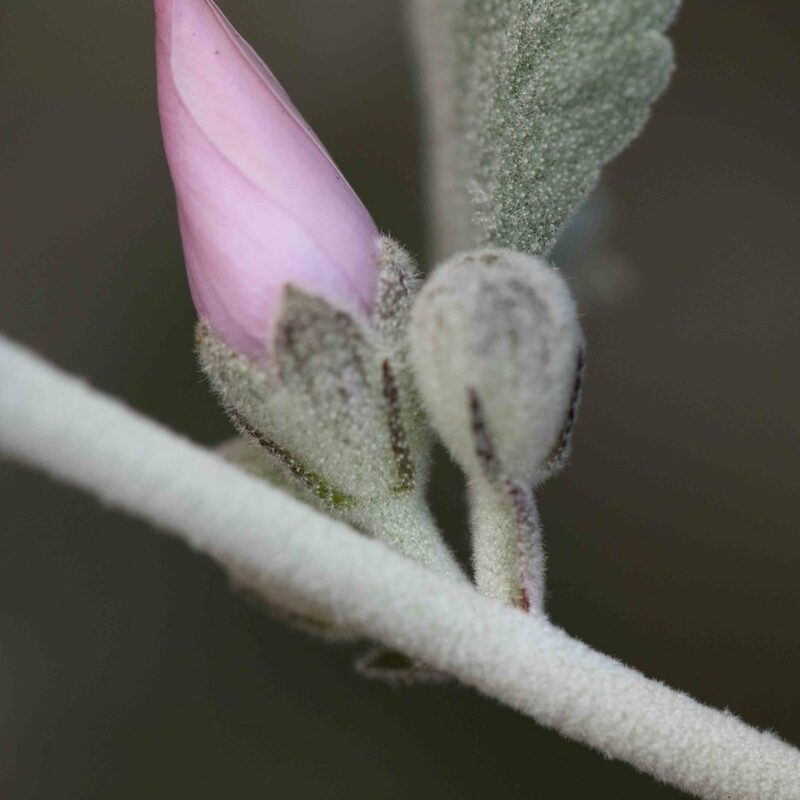 The silvery-green leaves are lobed and wavy, 1–3.5 cm across. 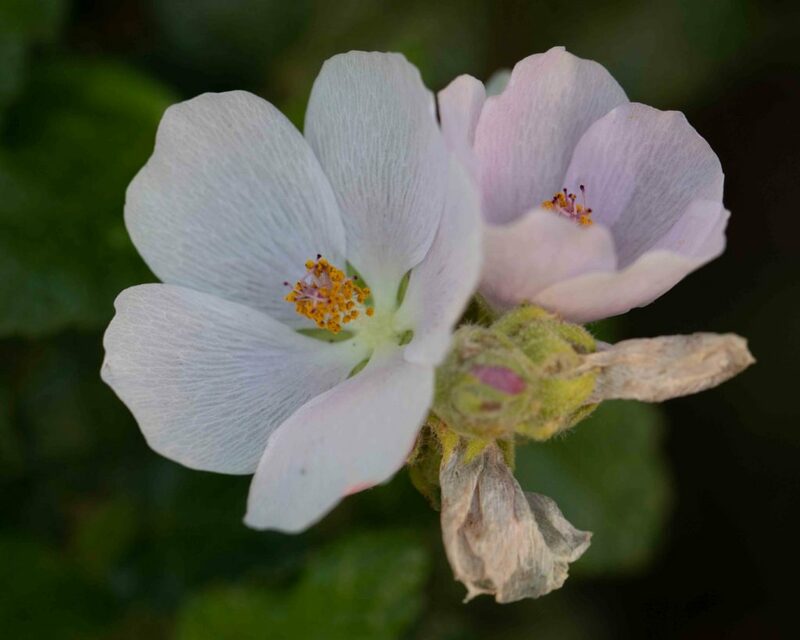 The flower is cup-shaped with 5 petals, white or pale yellow sometimes with a rosy tint. 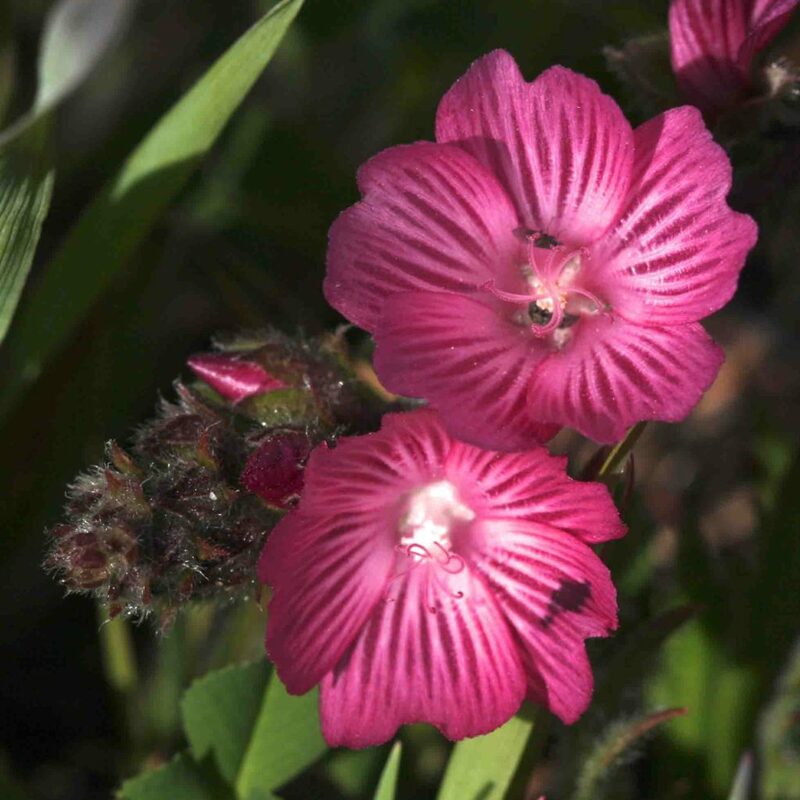 The sepals are pink. The fruit has 7–10 segments. 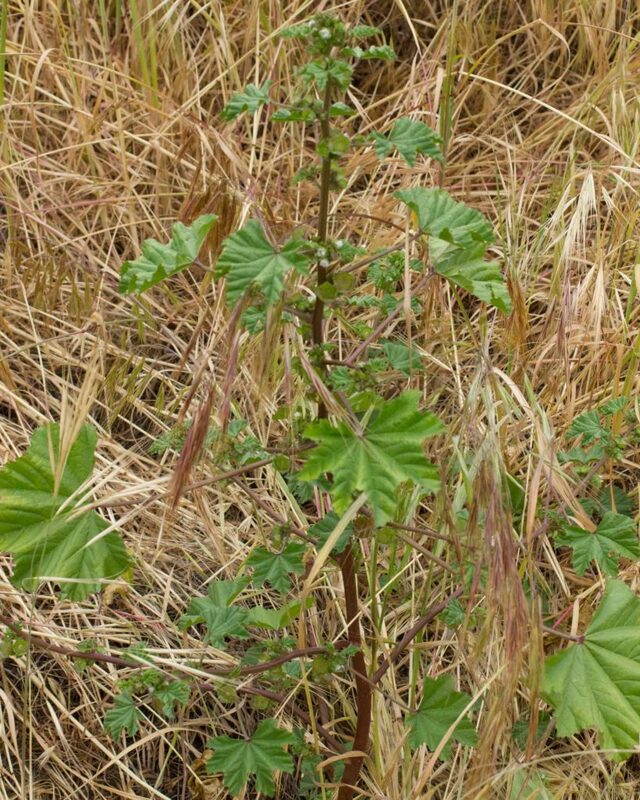 A common plant, though variable in its appearance. 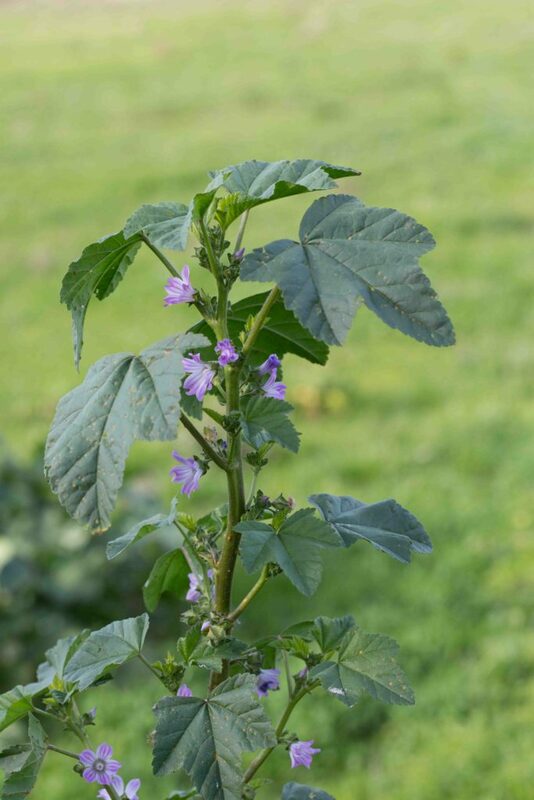 Generally low-growing and spreading, it can also send up tall, erect stems. 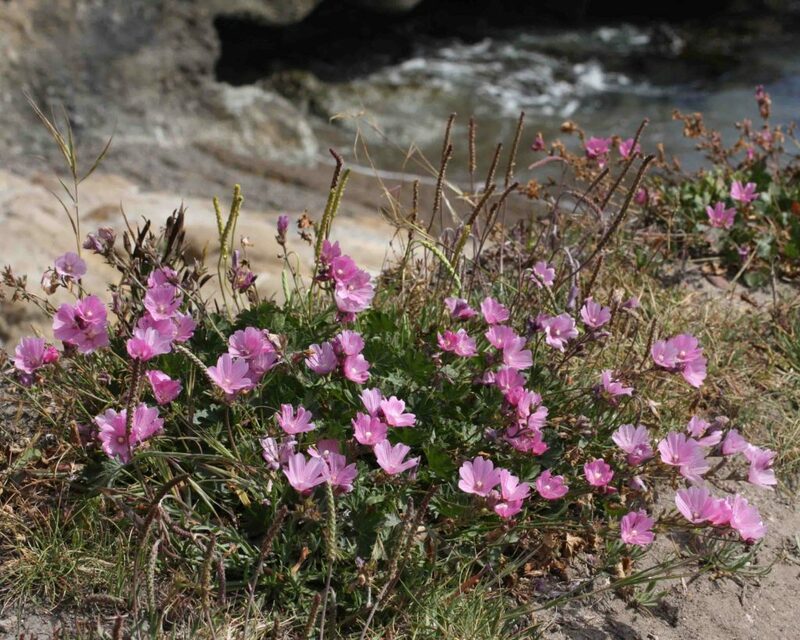 The flowers have 5 bright to dark pink petals with prominent veins. 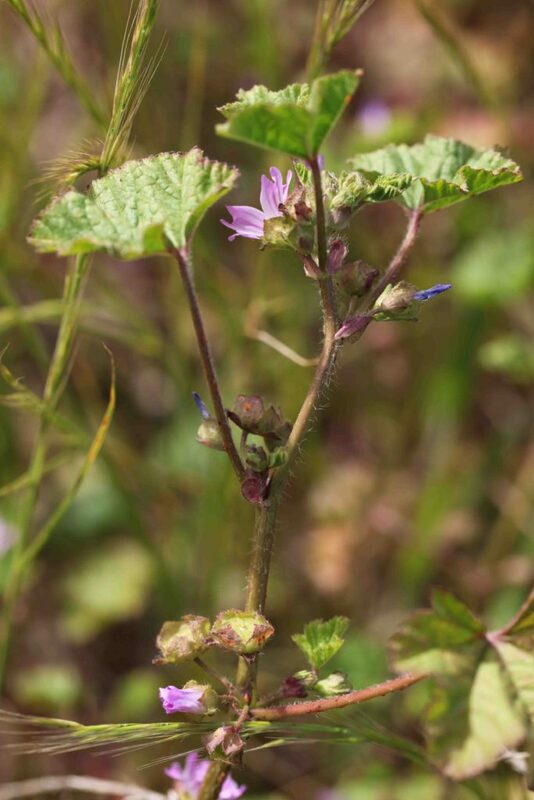 Lower leaves are 2–6 cm across, fan-shaped to almost circular with 7–9 lobes, often dissected but not deeply. 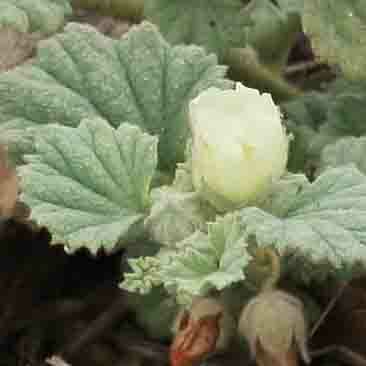 Upper leaves are much smaller.